Fever is common in children but is not necessarily harmful, nor is it always evidence of a serious illness. Fever is a sign that the body’s inflammatory response has been turned on. The most common cause of this is a viral or bacterial infection. Fever, or higher body temperature is thought to be adaptive and beneficial in that it helps neutralize the infecting microbe. For children of any age, parents and caregivers should be attentive to changes in eating or sleeping habits, coughing, pain or other marked changes in a child's behavior. When does a child have a fever? A child is considered feverish when he or she has an oral or rectal temperature of 38.2 Celsius (100.7 Fahrenheit) or higher. Mild flu symptoms, gastroenteritis and fever that generally lasts 3 to 5 days can be treated at home and do not require medical attention. 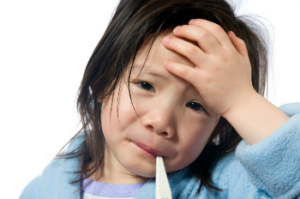 If fever remains present after 5 days along with other symptoms (such as runny nose, coughing, sore throat, etc. ), consult your pediatrician or family doctor, or head to your nearest network walk-in clinic. Don’t hesitate to call 9-1-1 if ever your child’s condition deteriorates seriously. Your child may not feel like eating much with a fever. To prevent dehydration, give your child plenty of fluids -- water, juice, soup, flavored gelatin or ice pops. Use acetaminophen or ibuprofen if your child's temperature is causing him or her discomfort. Reducing the fever does not change the natural course of the illness, but often makes the child more comfortable. A comfortable child is more likely to drink and eat which is important in fighting an infection. Be sure to follow the package's instructions for your child's age and weight. Do not give children and teenagers aspirin or aspirin-containing products, because they have been linked to Reye's syndrome, a serious condition that can lead to coma and death. Dress the child lightly and use lighter bedclothes to avoid overheating. About 5% of children between 6 months and 6 years of age sometimes have seizures or convulsions (called febrile seizures) when they have a fever. These seizures are seldom harmful and are caused by the combination of a virus and a change in temperature in a susceptible child. During a seizure, protect children from hurting themselves by keeping them away from nearby objects and making sure they are breathing freely. These seizures most often stop by themselves within a minute. Report the seizure to your child's doctor. If the seizures continue, go to the emergency room. There are several ways to take your child’s temperature. Our experts recommend rectal and oral methods because of their accuracy, and advise against checking temperature more than once a day. Additional temperature readings add little value. An accurate temperature reading is especially important during the first 3 months of your child's life. During this time, a rectal thermometer remains the most accurate way to measure your child's temperature.